Flavors of Belize teams up with Chef Sean Kuylen to make dukunu in episode 2, and Chef Sean explains how to make dukunu the easy way. He also adds some shrimp to the mix. Who's hungry? "Tonight on the menu is a traditional Mayan meal that's popular not only in Belize, but throughout the Caribbean and the Americas. It's name varies depending on location, but here in Belize it's known as 'Dukunu.' Chef Sean deconstructs this normally difficult and time consuming dish, and re-constructs it in a way easy for anyone to attempt right at home. Still keeping with the original elements of the dish, he makes it his own by adding his twist to this well known cultural meal." This week on Cooking with Flavors of Belize and Chef Sean Kuylen, he explains bruschetta - spoiler, it's a fancy way of saying 'toast' - and makes some mango pico de gallo to top it all. He gives some great advice on using cashews instead of pine nuts. Another great dish. "Chef Kuylen prepares this delectable recipe submitted by popular local hotspot - The Riverside Tavern. Located in Belize City, they're known for their original menu items, a mean burger, and a very happy happy hour. A recipe that is especially appropriate for this time of year as they make for the perfect finger food for your Thanksgiving or Christmas parties if you want to infuse a little Belizean flavor into the mix." It's christmas time and there's no celebration of this special time of year that would be complete without a proper ham! Chef Sean adds a sweet citrus taste to his ham for the second part of Cooking with Flavors of Belize's Christmas Special. Try this recipe if you want a twist on your classic Ham recipe. A classic Belizean dish, perfect for an appetizer at dinner time or a quick snack. And as usual, Chef Sean puts his spin on things adding Belikin Lighthouse Beer to the batter while giving chefs at home good tips when preparing this simple dish. Tanya McNab is the visionary behind the highly regarded Flavors of Belize magazine – cookbook and robust YouTube channel. McNab created the Flavors of Belize cookbook to engender an exchange of Belizean food and culture with the rest of the world. It is her wish that every kitchen will experience something special from Belize. Please tell me more about Flavors of Belize Magazine? 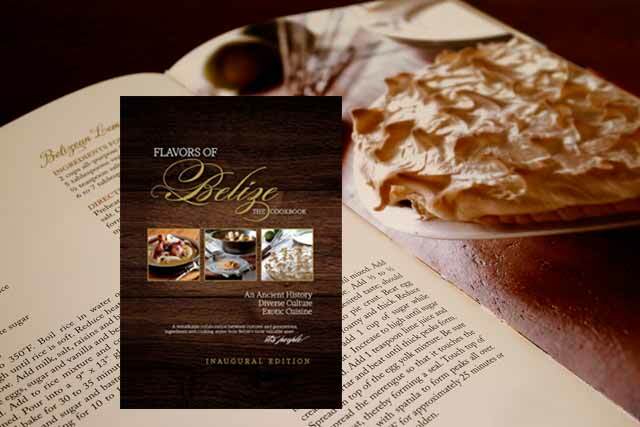 The Flavors of Belize Magazine is Belize’s first comprehensive culinary book. We get hotels, restaurants, and service providers including anybody from real estate agents to photographers to come on board with us; we combine that with noteworthy information, entertaining articles, breathtaking pictures, and recipes from our cookbook – and there you have it – The Flavors of Belize Magazine. How did you come up with the title “Flavors of Belize”? We struggled with a name that would be the right fit, becausef even at the start, while the future was unknown, we knew this project would grow significantly after its birth and so we wanted a name that was literal enough for someone to know exactly what it was the minute they looked at it. The word “Flavors” encompass such a wide range of things and we thought it was the perfect fit, and of course we wanted the name “Belize” to be on anything we did. Tell me a little bit about the cover of the publication. Who designed it? Why did you go with that particular image? The publication cover changes every year. I am not only the publisher, but lead graphic designer on the project. Each year, the cover takes a different light, but we like to focus on things that we do best! Such as our seafood, which is always fresh, our local and fresh produce and use of items that are an essential part of cooking in Belize. The cover coming in 2014, utilizes the combination, or seafood, plantains, rice and the coconut – all part of essential everyday meals in Belize. What inspired you to start this publication? The project was a natural progression as our design business had been working on publications within the tourism industry and while traveling one day, found a similar periodical for a different destination, we knew right away this was something Belize was significantly lacking and took it upon ourselves to start to create it. What fascinates you about Belizean Cuisine? The fascinating thing about Belizean cuisine is that we are able to pull influences from all over the world, while still being able to call it our own and stand apart from all of them. Due to Belize’s rich history of welcoming so many immigrants from across the globe, our country, culture, and inevitably our cuisine has become a fusion of these many different influences and that is what makes it so special. We have dishes that can blend the curry brought here by the Indians with chocolate, a staple of the Maya for a dish that is a hint at both cultures but so different that it’s in a category all on it’s own. We don’t realize how lucky we are to enjoy good food almost everyday with such ease and inexpensively at that. What are your 5 favorite Belizean recipes? Who is your intended audience and why should they read your publication? Well, the periodical is a guide and we cater to those who need and utilize this aspect. People visiting the country generally have to eat out at least 3 times a day, but don’t know where to go much less where exactly to find the kind of food they’re looking for. I can’t tell you how many times I visit a country and I simply don’t know where to find good food. In America, it’s easy if you don’t have a problem with fast food – there’s a McDonalds almost every 15 minutes. In Belize, however, this isn’t the case – so we found something that people find useful and we provide it – for anyone coming to Belize who may not necessarily be familiar with where to stay or eat, what to do, etc., additionally even Belizeans benefit from the listing information in our magazine. Mainly, we want to encourage people to use the guide, this year we will also have smaller versions available so people can take with them when they are moving around. They are free, so we encourage people to share it with friends and family. The publication is continuously growing and taking shape and in the future you will find this periodical to be more of just a food guide, its not only that but has tour recommendations, hotel recommendations, recipes and as brand, people can look forward to seeing a 2nd edition of the Flavors of Belize Cookbook coming in 2014/2015 as well as more cooking shows with Chef Sean Kuylen. How can we contact you or find out more about Flavors of Belize? You can keep up with us on our website, www.flavorsofbelize.com, you can find us on social media sites – specifically, Youtube, Facebook, Pinterest, and Instagram. Also, if you have any specific questions – feel free to shoot us an email. The Flavors of Belize cookbook represents a remarkable collaboration between Belize's most valuable asset... It's people. Your culinary journey would be incomplete without sampling the flavors and traditions of some of Belize's most diverse cultures: Maya, Mestizo, Creole, East Indian, Garifuna, Lebanese, Chinese, Mennonite, Caribbean and British, all of which are represented in this cookbook. As Central America's gateway to the Caribbean, the beautiful beaches of Belize welcomed a fascinating parade of immigrants from remote corners of the globe. When all of these cultures came to peacefully coexist in such a small geography, their food was magically infused with a worldly flair. That is why Belize cuisine today is unlike that of any other country, yet hints at certain familiar tastes and influences you many have experienced from all corners of the world. Flavors of Belize is the most comprehensive compilation of Belizean recipes; recipes from across cultures and recipes handed down through generations. The recipes contained within these pages will tantalize your palette and the enchanting variety of experiential dishes will bring good cheer to your kitchen, family, and friends. Flavors of Belize is online. Check out their latest issue. Flavors of Belize has a new mobile app. It's free on itunes and Google Play. The launch coincided with the Carnival parade, and they had a great float. Olivera Rusu Photography got some great shots of it. "The Flavors of Belize App is a combination of our annual magazine, our cookbook, and our cooking show. We provide a free, easy to use guide on your phone that highlights accommodations, restaurants, & hotspots throughout Belize all conveniently separated by area and categories."